Hi friends, this post contains affiliate links. Thanks for your support! Summer is almost here, and I'm still in crochet mode! I just can't get enough! This time of year, when you can't bear the thought of making scarves and mittens, make practical items instead. 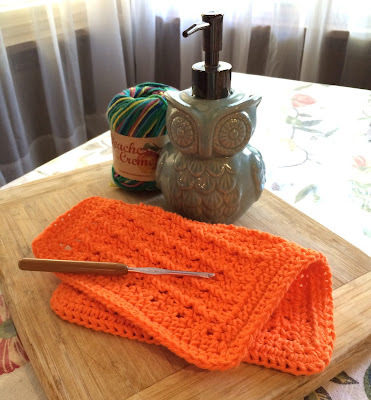 Dishcloths, scrubbies, and hanging towels are fun-to-crochet household accessories that can be beautiful and useful. Best of all, they're (practically) free and are custom made to match your home and kitchen because you pick the color! I came up with this pattern because I wanted a textured cloth that I could use as a dishcloth, for wiping counters or for scrubbing. It would also make a nice washcloth. 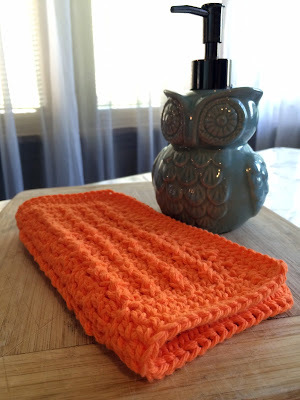 You could even make spa baskets for gifts and include a handmade washcloth! Make sure to use 100% cotton yarn. I tried making one out of regular acrylic yarn, and while it was super soft after machine washing, it fails as a kitchen dishcloth because it just doesn't dry out while laying on the edge of the sink. I do plan to keep the acrylic one and use it as a trivet. I wouldn't trust the thickness fully as a potholder, unless you made two and sewed them together back-to-back, which is another great and useful idea! Here's a friendly tip about dishcloths that my mother passed on to me: After using, rinse it out in the coldest water possible before wringing and laying out to dry. The cold water prevents bacteria growth and the cloth remains fresh and smell-free for several days longer than normal! It really works! So please enjoy my latest offering, and as always it's FREE! If you'd like to OWN this pattern on PDF, a sleek, printer friendly, portable version is available here or click the buy now button to be directed to my Ravelry Shop! Thanks for supporting Haute Kippy! I heart You! bpdc- back post double crochet. A stitch made around the back of the post of the dc instead of into the “v” on top of the dc. Yo, insert hook from back to front, then back again around the post of the dc indicated, draw up a loop, yo pull through 2 loops on hook, yo pull through last 2 loops on hook. Bpdc made. Fpdc- front post double crochet. A stitch made around the front of the post of the dc instead of into the “v” on top of the dc. Yo, insert hook through the front to the back, then in front again around the post of the dc indicated, draw up a loop, yo pull through 2 loops on hook, yo pull through last 2 loops on hook. Fpdc made. Notes for post stitches: After completing a post st, the “v” of the st in the row below will remain empty, as you made a dc in front of, or behind it instead of on top of it. Be sure not to mistakenly st in that “v” when making your next regular dc. If you do, your ridges will not be parallel! “hdc evenly along edge” means make approximately 2 sts into the side of every dc along the edge until you reach the corner. 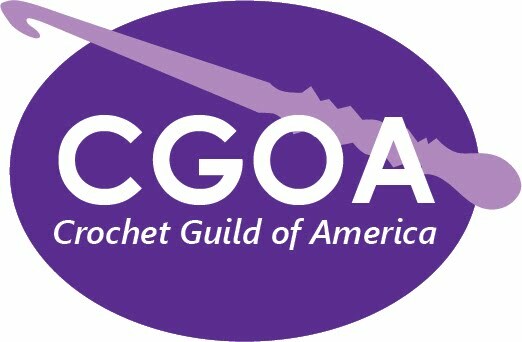 There are many tutorials online which further explain the specific techniques and rules of thumb for edge stitching. “Invisible join” is a technique of joining rounds by sewing a faux stitch into a project’s final stitches with a yarn needle in order to avoid the noticeable knot made when finishing with a slip-stitch. There are many helpful tutorials online to assist with this finishing technique, if desired. Row 3: dc in each of the first 2 sts, *bpdc in the next st, dc in each of the next 2 sts*, *repeat across. Ch 2, turn. Row 4: dc in each of the first 2 sts, *fpdc in the next st, dc in each of the next 2 sts*, *repeat across. Ch 2, turn. Rows 5-13: repeat rows 3 and 4 five more times. On row 13 at end, ch 1. Do not break yarn. Round 1: hdc into each st across, make 3 hdc into the last st to form corner. Pivot work, hdc evenly along edge of cloth, make 3 hdc into bottom corner. Slst into each hdc along the bottom edge, make 3 hdc into corner. Hdc evenly along edge of cloth, make 3 hdc into top corner, join with a slst to first hdc of rnd, ch 1, do not turn. Round 2: *hdc into each st across to corner, at corner, make 3 hdc into the center st of the 3 hdc group of the previous rnd*, *repeat for each edge around. Join with a slst or an invisible join to first hdc of rnd. Fo, securely weave in ends. 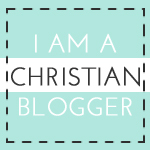 How do you plan to use your cloth? You may sell items made from this pattern, but please be courteous, always credit Haute Kippy with the original design and link to my blog where possible. 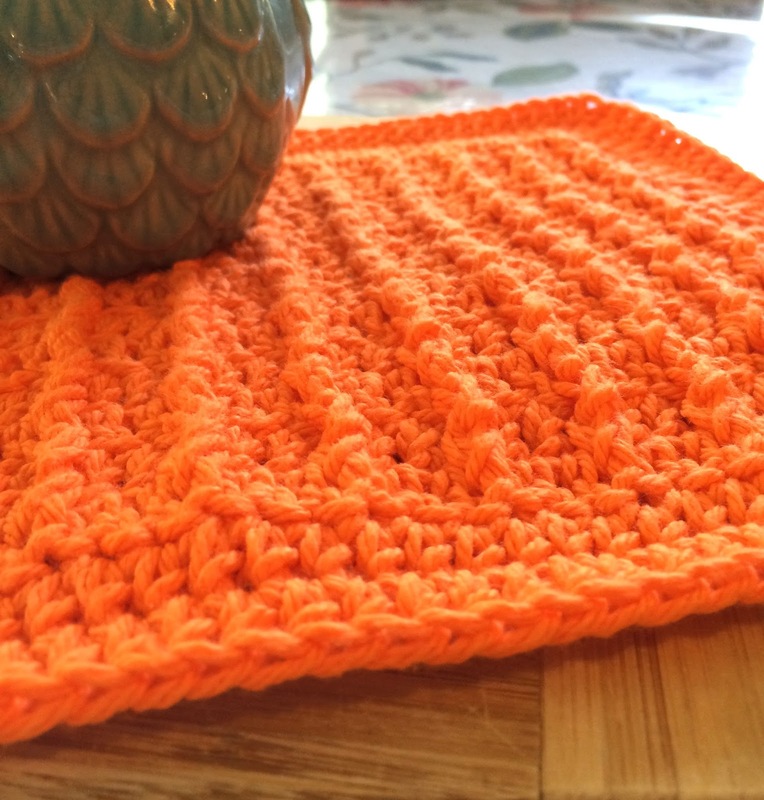 Please do not use any yarn other than cotton yarn for trivets and/or potholders! Acrylics and such can melt at high heats and cause injuries. 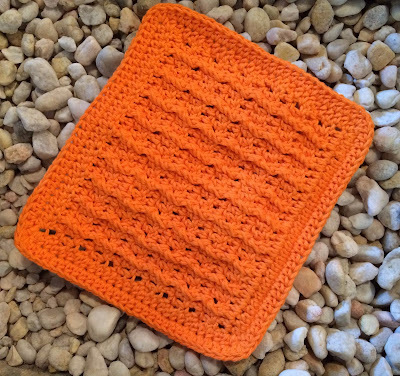 I'm looking forward to making this dishcloth. Thank you for sharing! Your comment was posted in duplicate, so I fixed that. Thank you for your safety concern! Everyone should definitely use care in handling hot pots and pans in the kitchen, and acrylic yarn definitely melts. It is a kind of plastic, and as we all know plastic melts. This is why I would never use it as an oven mitt to take an item out of the oven. 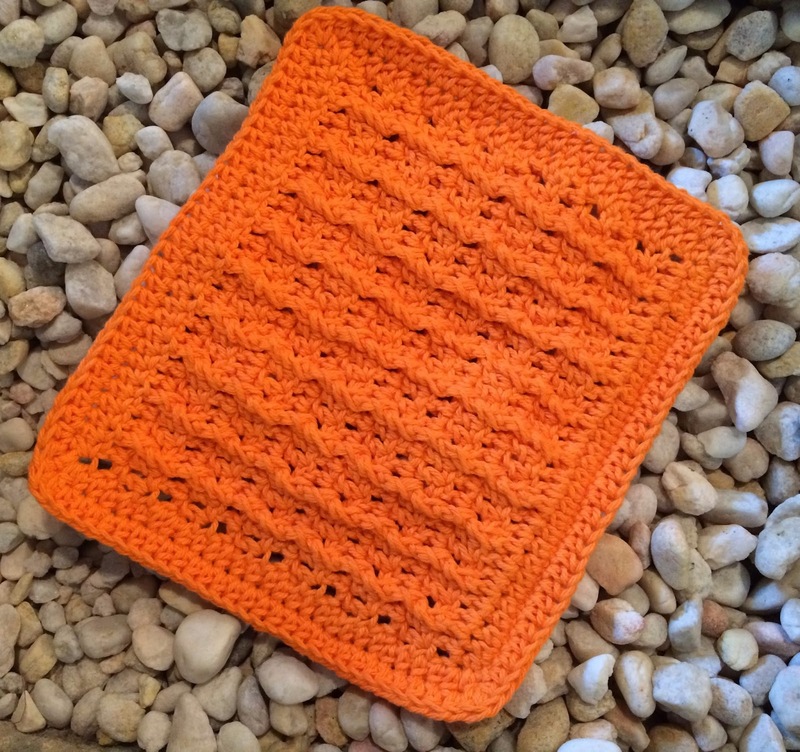 When I said potholder, I meant it in the context of holding onto the handles of a pot or pan. My pot/pan handles are insulated or are plastic (as I guess most are these days) but they still get a little too hot for bare hands sometimes. Additionally, when I said trivet I meant placing a serving dish on top of it, like on the dining room table. I would never place something directly out of the oven or directly off a burner on to acrylic yarn, and I don't recommend any one else do either. Thanks for pointing this out, and in the future I'll be sure to be more specific and descriptive about exactly what I mean, so there's no confusion. Hey Sande! Try this: Go to print, then where it says "destination" you can choose your own printer or click "change". When you click "change" there should be an option for "save as a PDF". This will allow you to download the file, saving it on your computer where you choose as a .PDF. Hope this works for you! Thanks for your interest in my pattern!